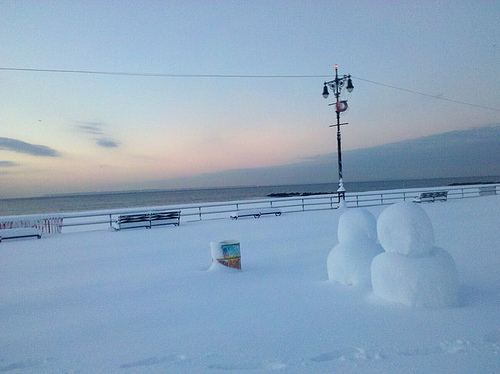 When Coney Island photographer and resident Bruce Handy ventured onto the snow-laden Boardwalk at dawn, he was greeted by these two primitive snowmen. This month is now the snowiest January in New York City history, according to AccuWeather.com. The snow total for yesterday and today is 19 inches! If you’re heading out to Coney to take photos, be on the lookout for Polar Bears: Tom “Iceman” McGann says “snow swim = Thursday noon at Stillwell”! But where are their heads, poor fellows? ha! that’s true, even primitive dolls have primitive faces. maybe they are “starter” snowmen. someone may come along and complete them? same type of primitive snowman, but a whole army of them, on Carmine St in the Village! Photos/Video: Snowpeople Army Gathering On Carmine St.